Last December when I wrote about my plans to tackle a 'special' challenge each month in my 60th year, I listed swimming The Sound of Harris as a possibility. We came close. We swam IN the Sound of Harris. yeah, OK - not close at all. I was nowhere near swim-fit enough to manage the crossing and I hadn't put enough effort into finding a support boat. Swimming a big crossing is not something you do on a whim. It takes planning and training. We'd been staying on Benbecula to film The Heb adventure race for The Adventure Show. It'll probably be on BBC-2 Scotland early in 2019. We stayed an extra few days to walk and swim off the Uists and Berneray. It felt particularly poignant to take this photo. The white building is the Gatliff Trust Hostel where I stayed thirty-one years ago on my first visit to the islands. I wrote a piece about cycling the Outer Hebrides, a relatively rare occurrence back then, and the story appeared in The Sunday Times the year. 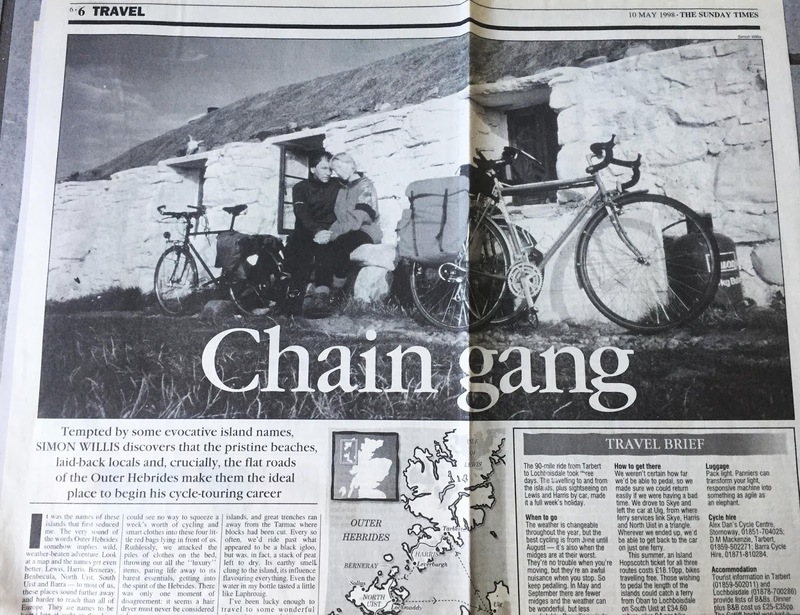 It ran in May 1998 with a photo of me and my then wife outside the hostel. I later learnt that copies of the article were pinned up in some of the tourist information offices along the route. I've since been back to the island kayaking and now swimming. I suspect that wee white building will long outlast me. Perhaps one day I'll actually swim across the Sound of Harris from it.